Birthstones have been used since at least the first century as a way to give good luck on ones birthday. Gemstones are associated with each month and each precious stone has designated qualities associated with it. These gemstones corresponded to the zodiac signs of the time. The Modern Birthstone list is the official birthstone list from the American National Association of Jewelers, Jewelers of America. These gemstones were officially adopted in 1912. In the US, this is the accepted list. Tanzanite was added as an additional birthstone for December by the American Gem Trade Association in October 2002. Diamonds are wonderful presents due to their beauty, rarity, durability and glamour. Diamond gifts seem to be always appreciated. Diamonds stand for purity, eternal love and faith in most countries. Diamonds are most commonly colorless. Rarely, black, blue, brown, gray, green, pink, red, and yellow diamonds are mined according to the impurities involved. Though Diamond has a hardness rating of 10, it is considered to be brittle and will shatter on sharp impact. Often colored diamonds are painted or irradiated. Though diamonds are quite durable, they can chip and fracture when handled roughly. Store diamonds separately. Be aware that diamonds can scratch other jewelry as well as each other. 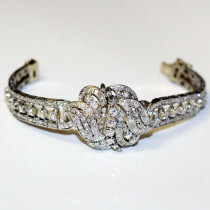 Diamonds have been revered throughout history. Used to embellish such items as crowns, swords and emblems as well as jewelry, they've even been part of national holidays. Queen Victoria declared the celebration of her 50th year of reign a "Diamond Jubilee." Diamonds have also been credited for having certain medicinal properties. During the middle ages, these gemstones were thought to heal illness, but only if the ailing person took the Diamond into bed to warm it up first! India is thought to be the first river-bed source of Diamond mining, but today these gemstones are found primarily in Australia, the Soviet Union, and Africa.